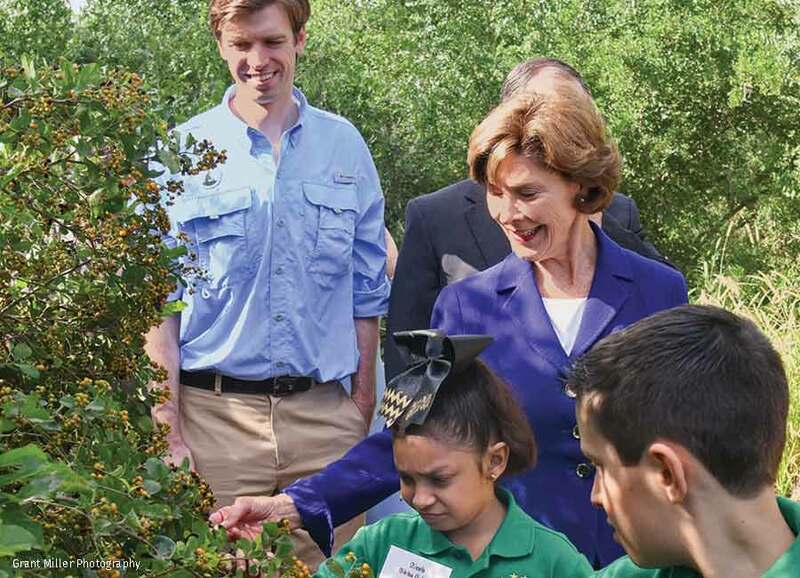 National Wildlife Federation President and CEO Collin O’Mara joins former First Lady Laura Bush and students from Geraldine Palmer Elementary School in Texas on a tour of their NWF certified schoolyard habitat. RECOVERING AMERICA’S WILDLIFE is going to take every American doing her or his part. A key part of the National Wildlife Federation’s strategy is to build strong partnerships and engage our nation’s youth to accomplish amazing conservation successes on the ground in every part of the country. I recently enjoyed celebrating a conservation milestone in South Texas with one such partner, Texan By Nature. Former First Lady Laura Bush founded this extraordinary group to advance conservation by bringing together conservationists, businesses, health care organizations, schools, faith-based organizations and the scientific community. The National Wildlife Federation has been working with Texan By Nature on monarch butterfly conservation since 2015, and in November I joined Mrs. Bush and her talented team in McAllen, Texas, to honor the Lower Rio Grande Valley Learning Landscapes Initiative with a Texan By Nature award: the Conservation Wrangler. The initiative has recruited five school districts representing 163 campuses in South Texas to create Schoolyard Habitats® as outdoor classrooms. The districts’ goal is to become NWF Certified Habitat School Districts. Students at Geraldine Palmer Elementary are already well into outdoor learning; they led Mrs. Bush and me through their extensive school garden, pointing out which creatures were attracted to which plants while butterflies fluttered all around us. These children are well situated to learn from nature, living in a unique transition zone between temperate and tropical climates that sustains a huge diversity of plants and wildlife. The bird life alone lures thousands of visitors annually, and some lucky visitors to the area’s three national wildlife refuges may even glimpse a rare jaguarundi or ocelot. Yet the valley’s wildlife is threatened by a proposed border wall that would bisect migratory corridors in places like the Santa Ana National Wildlife Refuge. I was heartened to learn about more effective, less intrusive, less costly technology-based approaches that would increase security without harming wildlife—a solution we will champion in Washington. As I travel the country, I am inspired by Americans who cherish our wildlife heritage. Despite challenges, and joined by great partners like Texan By Nature, we will succeed in increasing America’s wildlife populations.